Only Waterfront and Seaside. Only the Best! 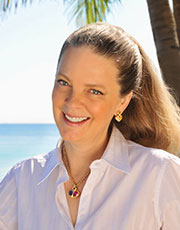 Niki Higgins is known as the "go-to" agent for luxury oceanfront, waterfront and seaside real estate in South Florida. Throughout her highly successful career, Niki has exceeded over $1 billion in real estate transactions and has closed numerous record-breaking deals throughout South Florida. She is a consistent leader in the industry, with a reputation for tenaciously protecting her clients' interests. Concentrating her efforts on the luxury real estate market from Miami Beach to Palm Beach, Niki Higgins has established a highly impressive resume of multimillion-dollar waterfront home and condo sales. Additionally, her remarkable business acumen has been lauded in numerous high-profile real estate publications. Niki's experience, expertise, uncompromising integrity and cutting-edge marketing strategies have kept her at the forefront of the South Florida luxury real estate community for over 15 years. She is well-respected in the industry, not only for her unparalleled professional track record, but also for her honesty and exceptional work ethic. 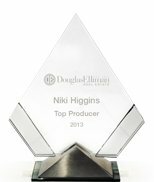 Niki's comprehensive real estate knowledge and dedication to her clients has consistently earned her Top Producer honors and also awarded her Douglas Elliman Florida's prestigious #2 top-producing agent company-wide for 2013, 2014 and 2015. Niki Higgins originally established Seaside Properties Group in 2000 to fill a much-needed void in the South Florida real estate community for a specialist in luxury waterfront and seaside properties covering Miami Beach to Palm Beach. After quickly becoming one of the area's preeminent real estate brokerages, Seaside Properties Group was acquired by Douglas Elliman in October 2012. Prior to her success in Florida, Niki sold exclusive Manhattan properties for Douglas Elliman. Niki's clients had very specific goals and requirements, and Niki became an expert at finding the absolute perfect property for a very privileged few – a skill she undoubtedly still possesses today. Within the highly competitive luxury real estate market, Niki Higgins continues to set sales records and consistently provide her clients with the outstanding level of knowledge and service that has made her one of South Florida's premier elite agents. Whether buying or selling, Niki understands the process completely and focuses her efforts on taking the pressure off her clients, allowing them the freedom to make the best decisions possible to suit their needs.